One more dress finished and worn this May! I also cut this one out a month ago, but just got it sewn up last week. 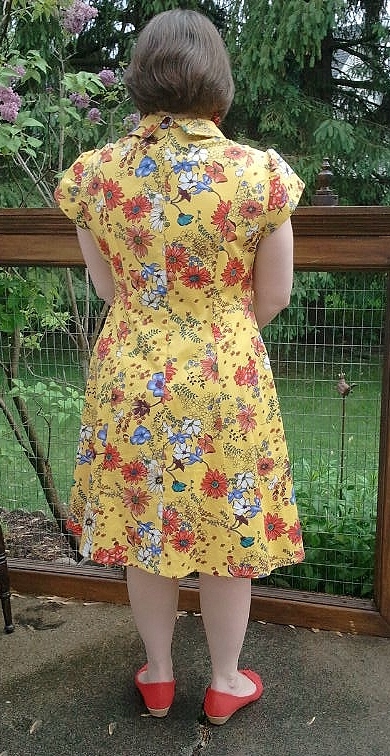 I love this bright and crazy fabric...I stalked it at the fabric store for at least a year until it was finally on sale and I decided to go for it :) It is a cotton sateen with a nice stretch; quite heavy and very amenable to taking the shape I wanted it to. I knew I wanted to make New Look 6299 when I first saw it. I like the shape of a dress that has no waist seam breaking up the line of the dress. Also I wanted to make something that was dependent on princess seams so that I could improve in my ability to sew them properly. 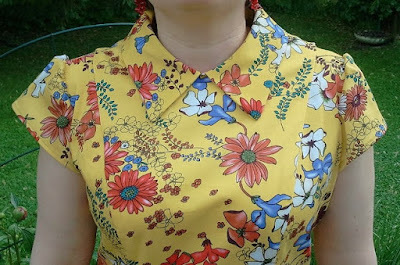 I chose View A, with sleeves and collar. I hadn't even noticed until I got the pattern pieces out that View B & C have gored skirts. Hmmm, more ideas for later! I adjusted the paper pattern pre-cutting with my regular above-waist shortening alterations, and also graded from a 14 at the neckline and upper shoulder to 16 across the bust and waist, to an 18 at the hips. I ended up taking in 1/2" along the bodice front princess seams, between shoulders and waist, and in the back I took the bodice princess seams in by 1" on each side. I'm not sure if it was the stretch of the fabric that necessitated so much taking in, or the weight, as the back sort of stuck out and sagged at the same time when there was too much fabric there. 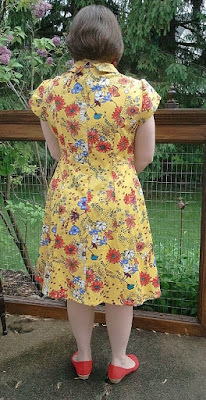 In any case, the princess seams do make for really easy adjustments. Once I'd taken them in I loved the way the bodice fit. The only thing I didn't do that I may do next time is to take a little bit of the length from the upper back (like 1/4 or 1/2 inch across the shoulderblades) as it puffs out a wee bit when I am standing normally, ie: with not perfect posture. But really, those are minor adjustments, as I love the way this dress fits now. I decided on View A with the collar just to give this dress a little more interest. 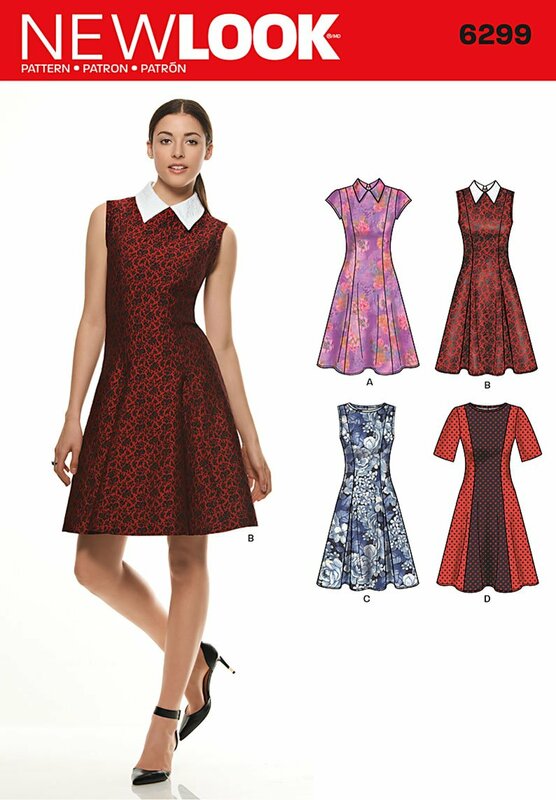 I like how high and large the collar is -- feels quite 60s. It has a button tab at the back that buttons over the top of the zip. I used a deep red button that matches the fabric well, but realized that it sits right above my yellow zipper pull, so might change it to a yellow button at some point. 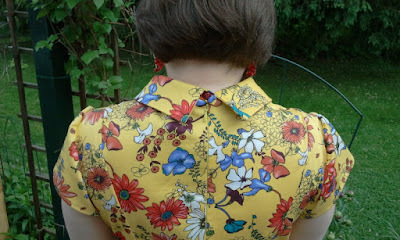 This is the first button hole I've made using my easy peasy new Janome buttonhole foot and wow, it really was easy. I was a bit nervous and made a few samples first, as I didn't want to ruin my collar -- not only was it a lot of work to get it made and attached, I also had no more fabric. 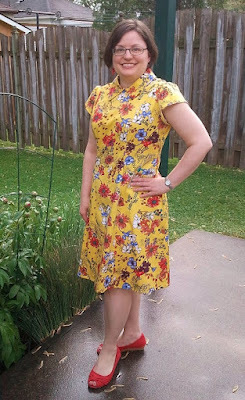 I had squeezed the pieces for this pattern on to every inch of my long coveted fabric. So thankfully, no problems there. I seem to be following quite a floral theme with my sewing this year. 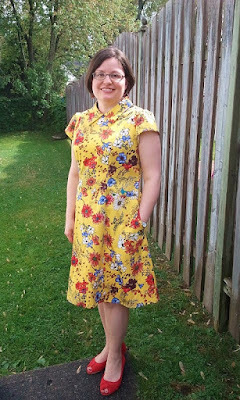 There's another in the queue that I hope to finish in the next couple of weeks that is also floral, so it looks like I'll have quite a bouquet of new dresses by the end of the summer. What do you think of the floral trend? Is it for you? Or do you prefer other prints? Or maybe even... solids? I've been clutching this pattern and flipping thru my stash- yours is so cute- I must commit!! You must! I would love to see this one on you. This is very cute! 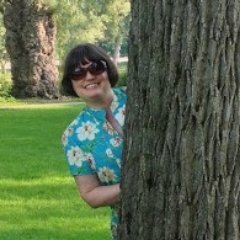 I love fabric stalking too. The fit is really great. Perfect pattern placement can be so satisfying! Thank you! Pattern placement can be wonderful when it works out well....not so much when you have one of those oops moments! I really like the collar and the cap sleeves - and pockets too. Great job. Very pretty dress. I have noticed lots of floral prints around this year so you seem to be right on trend. 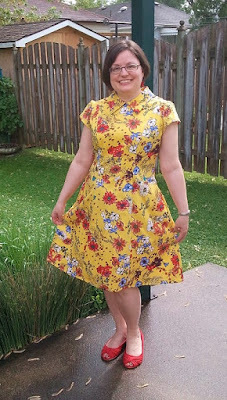 I loved this pattern when I saw it but it did not work for me (too much fabric in the shoulders and not worth my time to fix it!). Your version is so very lovely!! Yes, I saw your trial make and was thinking about that excess fabric at the shoulder. I should note that I ended up stitching the slope of the shoulder up a little -- from regular seam at the neckline to about a 1"seam at the shoulder. That little bit of adjustment seemed to help with my fitting. It is really 60's but classic, too. What a fun print and you got the fit down! The back of the collar is my favorite part. 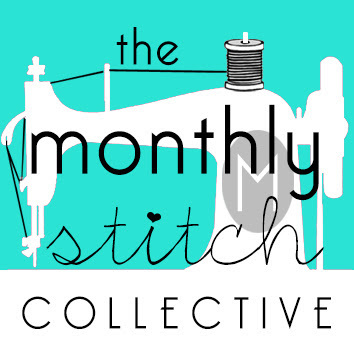 Thanks for linking up to Sew it Chic! Just bought this pattern and wanted to see how it would look on someone who wasn't the model in the picture. It's absolutely beautiful! Did you find that the pattern had pretty accurate sizing? I don't normally work with New Look patterns. New Look often fits a little large; make sure to measure the pattern and choose the size that corresponds -- I ended up making adjustments to take in extra fabric along the princess seams -- but part of that could be the stretch in the fabric. I do find that the shoulders in NL can be wide as well, so if that's an issue for you, make sure to adjust that too. Hei! you look fab in that dress! I just wanted to know how the recommended sizes fit you? I have the same pattern, and according to that I'm a size 18 at the bust an 20 at the waist and hips. 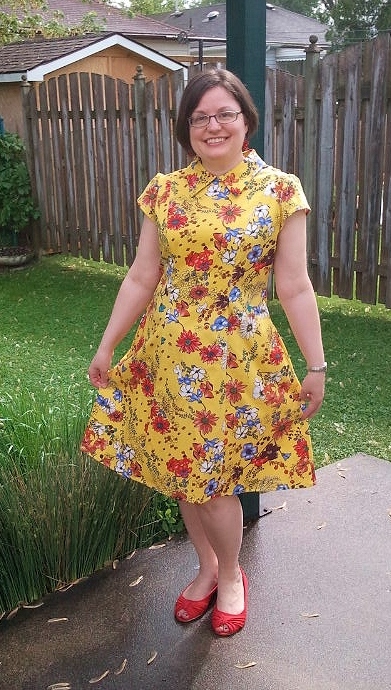 However, I've tried to make a Simplicity dress before and eventhough I followed the recommended size it was just so ill fitting - even at the places of the measurements (bust, waist, hips). So just wanted to know, if you felt that the sizes of the pattern coresponded well with the fit of the final product? or did you have to take in extra afterwards? And sorry I have to publish as "anonymous", the comment system would not recognise me. Hello! I felt that the bodice was a little large -- I took in extra width at the princess seams on the upper bodice after trying it on, so instead of 16 I probably should have cut 14 at the shoulders & bust area. But then the sateen I used is fairly stretchy as well. Otherwise I found the sizing quite reasonable to what you'd expect. Good luck!